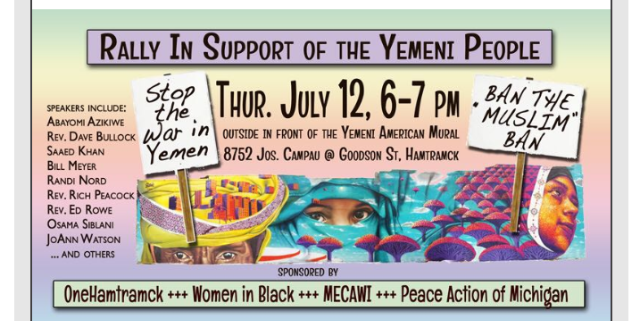 People from diverse backgrounds gathered in downtown Hamtramck, MI on Thursday July 12th, from 6-7 pm to protest “The No Muslim Ban,” and the cruelty being done to the Yemen population. Important keynote speakers included; Abayomi Azikiwe, Rev. Dave Bullock, Saaed Khan, Bill Meyer, Randi Nord, Rev. Rich Peacock, Rev. Ed Rowe, Osama Siblani, Tarek Al-Haidri and JoAnne Watson. The conflict within Yemen dates back to 2011 when the authoritarian president handed over his power to his deputy Abdrabbuh Mansour Hadi. Hadi was unable to handle the financial instability, corruption, unemployment and the food crisis the country suffered. Also, members of Al-Qaeda continued to attack the region of Yemen during this time. The Houthi movement emerged as a result. The movement contains a group of individuals who disagreed with Hadi’s presidential reign and decided to take power into their own hands. Today, the Houthi movement seized an area in Yemen called Sanaa and have become a modern version of the Al-Qaeda in Yemen territory. The protest was able to shine a light on the fear and problem with the Houthi Movement and the United States recent congressional order, “The No Muslim Ban.” People were able to voice their opinions through poetry to express their emotions. “As a child, I first laid my foot on this land. I stand here today a man tired and bend full of thriving I was proud of this moment, I am gripped by doubt. My heart is clutched in a great frame of despair my brothers are not cruel and this is unfair. I too must be a child to the tender soul I do not understand this humiliation. Must I really fall? My innocent life is seen before long deserting my cold eyes that thank me wrong. The darkness of mere thought of being abandoned haunts me like vicious wolves seeking retribution. Are you telling me history again is pushing into the present I fear the shadows of crime and racism stand. And this to the supreme court stands wrong. My religion is Islam, not insanity,” Recited Tarek Al- Haidri, a global activist. The recent protest is the first of several to come. Society needs to stick together in order to spread awareness about controversial issues occurring locally and globally. Yemen is suffering and not many understand the extent of what the people are going through on a daily basis. India and Pakistan: Cold Start for the Hottest War?